The VeloNews 2008 Official Tour de France Guide is many things. It's the best way to follow the race, with comprehensive maps, complete stage information, and detailed team information. It's the first place to turn to for expert analysis on the top overall favorites, fastest climbers and strongest sprinters. Plus, it's the richest source of Tour history, with stories and statistics on past winners and epic performances. At 228 pages, the 2008 Tour Guide is nothing less than massive, with more photos, more maps, more team news, more features, and more in-depth coverage of the world's greatest sports event. The 2008 Tour starts on July 5 in Brest, with a 197.5 km stage through the hills of Brittany. Encompassing 3,560 kilometers, the 2008 Tour is unique in that there is no Prologue (for the first time since 1966) and no time bonuses. The race will feature 5 mountain stages, 4 mountain finishes, and 2 individual time trials on its counterclockwise route through the Pyrenees and Alps before its finish in Paris on July 27. 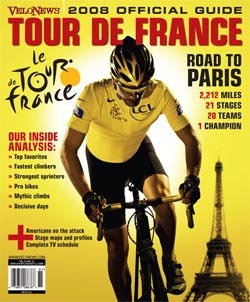 VeloNews subscribers receive the Tour Guide free as VeloNews issue 11. For everyone else, the Tour Guide is available now and shipping from VeloGear. Order at VeloGear.com or by calling (800) 234-8356. Quantities are limited. On June 17th, the Tour Guide will begin selling on newsstands, in bicycle shops, and at specialty retailers including Barnes & Noble, Books-A-Million, Borders, Gander Mtn., REI, and Sports Authority. Retailers that carry VeloNews will automatically receive an allocation of the Tour Guide as part of their normal draw of VeloNews unless they have made other prior arrangements. Retailers may order additional copies of the Tour Guide through VeloPress by emailing wholesale@insideinc.com or calling (800) 811-4210 x169. The Tour Guide is also available to the bike industry through VeloPress, American Cycling, and QBP. VeloNews is the Journal of Competitive Cycling and is published by Competitor Group, Inc. VeloNews is the official U.S. partner of the Amaury Sport Organisation, producer of Le Tour de France.